League executives at last week’s G League Showcase in Las Vegas were “raving” about the Nets‘ deal to lock up Spencer Dinwiddie to a three-year, $34.3MM extension, comparing it to the Clippers‘ three-year, $24MM agreement with Lou Williams, writes ESPN’s Bobby Marks (Insider-only link). According to Marks, two teams he spoke to in Vegas had Dinwiddie ranked as the third-best point guard in the 2019 free agent class before he signed his extension, placing him behind only Kyrie Irving and Kemba Walker. That would have put Dinwiddie ahead of younger players like Terry Rozier (Celtics) and D’Angelo Russell (Nets), both of whom are on track for restricted free agency. Rozier and Russell should benefit from Dinwiddie’s deal, since it takes one of 2019’s top FA point guards off the board and could create additional competition for their services. According to Marks, league execs in Vegas last week identified the Magic and Suns as probable suitors for Rozier and Russell, though the Celtics and Nets will have the upper hand until an offer sheet is on the table. Teams are monitoring Markelle Fultz, not just to keep an eye on his health and future, but also to see how Fultz’s status will impact Sixers teammate T.J. McConnell, according to Marks. McConnell is headed for unrestricted free agency and is unlikely to get an in-season extension if Philadelphia intends to maximize its 2019 cap room. McConnell could command a salary in the $5-7MM range, Marks notes. Teams around the NBA believe there could be a strong group of buyout candidates available later this season. According to Marks, the veteran players that clubs are keeping an eye on include Carmelo Anthony, Robin Lopez, Zach Randolph, Anthony Tolliver, Enes Kanter, Kenneth Faried, Jerryd Bayless, Iman Shumpert, Kosta Koufos, Alec Burks, J.R. Smith, and Jabari Parker. Some of those vets may be traded and some figure to remain with their current teams, but I could definitely see several of them ending up on the buyout market. During Jimmy Butler‘s final, acrimonious weeks in Minnesota, his ability to communicate with young Timberwolves players like Karl-Anthony Towns and Andrew Wiggins was called into question. Tasked with leading the club, Butler instead berated teammates in practice, questioning their desire to win and their ability to take criticism. By comparison, new forward Robert Covington, acquired in the deal for Butler, seems to have a better sense of when to talk to teammates and when to lay off, writes Chris Hine of The Star Tribune. While Covington has gotten on Towns a little, encouraging him to bring more of a “defensive mindset” to his role, it doesn’t seem to be negatively impacting the relationship between the two, according to Hine, who notes that Covington and Towns are constantly talking and making fun of each other in the locker room. The duo has helped the Wolves win seven of nine games since trading Butler. While Tyus Jones and Gorgui Dieng have been frustrated at times this season due to their limited roles, both players have excelled since Butler’s departure, says Jon Krawczynski of The Athletic. Within the same story, Krawczynski reports that there’s still no definitive timeline for Jerryd Bayless‘ return to action, though it’s not clear if he’ll have a role in Minnesota even once he’s healthy. While the Butler drama is in the rear view mirror, head coach Tom Thibodeau remains under the microscope, as Frank Isola of The Athletic details. Thibodeau’s long-term hold on Minnesota’s head coaching job is still tenuous, but he has done an excellent job with the new-look Wolves so far. Sixers managing partner and owner Josh Harris is both determined and optimistic that Jimmy Butler will remain with the team beyond this season, as he told USA Today’s Jeff Zillgitt and The Athletic’s Shams Charania. The Butler trade was made to give the franchise a third star alongside Ben Simmons and Joel Embiid and become a serious championship contender. It wouldn’t have happened unless the Sixers were convinced they could keep Butler, who can opt out of his contract this summer, in the long run. While Butler became a major distraction around the Timberwolves, he’s been a model citizen since joining the Sixers. And Philadelphia anticipates that its gamble will pay off in the long run in the form of a multi-year contract. Both reporters offered insights into the trade discussions involving Butler. The Sixers eventually agreed to deal Dario Saric, Robert Covington, Jerryd Bayless and a future second-rounder for Butler and throw-in Justin Patton. The Timberwolves initially asked for another starter in addition to the trio the Sixers dealt, according to Zillgitt. Minnesota narrowed its offers to three teams, with the Pelicans and Rockets being the other finalists, according to Charania. New Orleans dangled forward Nikola Mirotic and a first-round pick, while Houston was willing to part with guard Eric Gordon and two first-rounders. The Sixers initially offered draft picks and other large contracts, Harris told Charania. Markelle Fultz was discussed in the Butler talks. Other suitors, such as the Lakers, wanted to wait until the December 15th date when signed free agents could be included in a deal for Butler, Charania added. The majority of this week’s analysis on the trade package the Sixers sent the Timberwolves in the Jimmy Butler trade has focused on Dario Saric and Robert Covington, and rightly so. Those are the two players expected to contribute to the Wolves right away and to become potential long-term building blocks for the franchise. However, a third player, Jerryd Bayless, was also sent to Minnesota in the deal, and the impact his inclusion in the deal will have on the Sixers shouldn’t be overlooked. As we detailed in our financial breakdown of the Butler trade, the deal couldn’t have been completed without the inclusion of Bayless. Saric’s and Covington’s salaries weren’t enough to match Butler’s $20MM+ cap hit on their own, and salary-matching became even trickier once Justin Patton was attached to Butler. In order to make the trade work financially, the 76ers had to include Bayless and his $8.58MM cap charge. The loss of Bayless is hardly a debilitating one for the Sixers from an on-court perspective. The veteran guard has only played in 42 games over the last three seasons, with a knee injury currently keeping him on the shelf. Even when healthy, Bayless was unlikely to play much of a role for a 76ers team that already had three point guards in its rotation, in Ben Simmons, T.J. McConnell, and Markelle Fultz. If including him in the Butler deal was the final piece to acquire an All-NBA player, it was, of course, a no-brainer for Philadelphia. Still, Bayless’ lack of a rotation role, his expiring contract, and his mid-level salary made him an ideal trade chip for a Sixers team that still needs to add shooting depth. Because he wasn’t part of Philadelphia’s rotation, the team could afford to give him up, and because he had no guaranteed money on his deal beyond this season, he would appeal to potential trade partners who didn’t want to compromise their future flexibility. For instance, the Sixers reportedly remain interested in Cavaliers sharpshooter Kyle Korver. Without Bayless, who was a part of the Korver trade discussions between the two teams in July, the path to acquiring Korver and his $7.56MM salary becomes trickier. In order to meet the league’s salary-matching rules, the Sixers would have to send out at least $4.26MM+. The 76ers have seven players earning more than that amount. Of those seven, Butler, Simmons, Joel Embiid, and J.J. Redick aren’t going anywhere; dealing Mike Muscala or Wilson Chandler wouldn’t improve the team’s depth, since the team is already relying on those players to be key rotation pieces; and Fultz’s stock hasn’t fallen so far that Philadelphia would move him for Korver. That means in order to match Korver’s salary, the Sixers would have to package at least a couple lesser-paid players. The expiring contracts for Patton ($2.67MM) and Furkan Korkmaz ($1.74MM) would work, and would probably be the most likely package – along with a draft pick or two – if Philadelphia makes a play for Korver or another shooter in his salary range, such as Jeremy Lamb or Wayne Ellington. The Sixers’ salary-matching options would become more complicated if they wanted to go after a player with a higher salary though. For instance, Kevin O’Connor of The Ringer suggested in a podcast that Kentavious Caldwell-Pope is one player on the team’s radar, as Bryan Kalbrosky of HoopsHype relays. Caldwell-Pope has a $12MM cap hit, which would be virtually impossible for the Sixers to match without using a rotation player like Chandler or a prospect like Fultz, now that Bayless is no longer on their books. There are plenty of ways the Sixers could get creative on the trade market, and it’s worth noting that the team may not even need to make any deals — after all, last season’s impact in-season additions, Ersan Ilyasova and Marco Belinelli, were both signed on the buyout market. Still, the Sixers can’t count on striking gold with players like Ilyasova and Belinelli again, and not having Bayless on the roster will limit their flexibility to some extent. Sending Bayless to the Timberwolves was necessary to land Butler, and the Sixers would do it over again every day of the week, but it will be interesting to see whether a player who was an afterthought in that deal will hamstring the franchise’s trade options later in the season. NOVEMBER 12: The Sixers and Timberwolves have issued press releases announcing that the deal is now official. 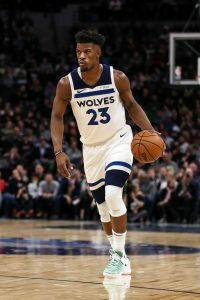 NOVEMBER 10: The Sixers have agreed to acquire Timberwolves star Jimmy Butler and Justin Patton for Robert Covington, Dario Saric, Jerryd Bayless and a 2022 second-round pick, according to Shams Charania and Jon Krawczynski of The Athletic (Twitter links). A trade call with the league to finalize the deal has been scheduled for Monday, Charania adds (via Twitter). Elton Brand‘s first major move as the Sixers’ general manager will allow the team to acquire a third star alongside Simmons and Embiid without having to take their chances trying to lure that sort of impact player to Philadelphia during 2019’s free agent period. It should also reduce the pressure on 2017’s first overall pick Markelle Fultz to develop into that third star. Butler and the Sixers fully expect to reach an agreement on a long-term deal for the All-NBA swingman once he’s eligible for free agency in 2019, per ESPN’s Adrian Wojnarowski (Twitter link). Philadelphia’s plan is to have a long-term big three of Butler, Ben Simmons and Joel Embiid, according to Wojnarowski, who suggests (via Twitter) that only a major injury or a poor fit alongside Simmons and Embiid could diminish the Sixers’ optimism on a long-term future with Butler. It remains to be seen how Butler will fit on and off the court in Philadelphia with the team’s two young stars after failing to make things work with Karl-Anthony Towns and Andrew Wiggins in Minnesota, but the four-time All-Star should significantly increase the 76ers’ ceiling. Butler will provide play-making and shooting (.361 3PT% since 2016/17) on offense, and figures to replace Covington as the team’s primary perimeter stopper on defense. 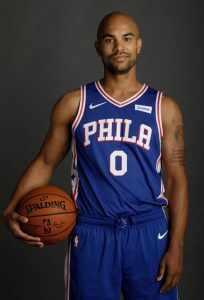 As for Patton, his NBA career has been derailed by foot injuries, and he’s unlikely to be a Sixer beyond this season. Even if they re-sign Butler in 2019, the Sixers won’t necessarily be capped out quite yet, with Simmons still on his rookie deal. As ESPN’s Bobby Marks details, with cap holds for Butler and fellow free agent T.J. McConnell to consider, the team would have about $21MM in cap room next summer. If the 76ers want to clear enough room for another max player, trading Fultz would just about get them there, though Philadelphia’s cap sheet could get messy in that scenario, with an eventual max deal for Simmons also on the horizon. For Minnesota, this trade will end a near two-month saga after Butler’s trade request went public. The week before training camps got underway, word broke that Butler had asked to be traded during a meeting with Timberwolves coach and president of basketball operations Tom Thibodeau and didn’t intend to report to camp. When the Wolves didn’t find a trade for Butler right away, he rejoined the team, but the last five or six weeks have been rife with drama. The 29-year-old’s return to Minnesota was highlighted by a now-infamous expletive-filled rant in a preseason practice, and things hadn’t quieted down much since then. Now that the Wolves have finally resolved the situation, the team will have an opportunity to focus on a future centered around former No. 1 overall picks Towns and Wiggins. The Timberwolves will now add Covington and Saric to that long-term core — Saric won’t be up for restricted free agency until 2020, while Covington is locked up through 2022. Both players make sense for Thibodeau, GM Scott Layden, and the Wolves, who didn’t want to take a significant step back in their roster-building process after snapping a lengthy postseason-less streak this past spring. Covington and Saric will be able to jump into the rotation immediately and should also be part of the team for years to come. Bayless is on an expiring contract and almost certainly won’t be part of Minnesota’s future plans, as he was just included in the swap for salary-matching purposes. If the Wolves don’t plan for Bayless to have a role this season, he’ll become a buyout candidate. Thibodeau, Layden, owner Glen Taylor, and the Timberwolves also reportedly discussed potential Butler trades with several other teams before agreeing to terms with the Sixers. The Rockets and Heat were said to be the most aggressive suitors, as Minnesota allegedly passed on a Miami offer that included Josh Richardson and a first-round pick, and also balked at a Houston offer featuring four first-round picks. We don’t know what the protections on those Rockets’ first-rounders or the Heat first-rounder would have looked like, and the Wolves likely would have had to take on an unwanted multiyear contract in each of those proposals. Still, it will still be fascinating to see how Covington and Saric pan out in Minnesota, since we have a sense of what sort of other packages were available to the Wolves. While Thibodeau exercised plenty of patience through the Butler saga, that patience ran out after the Timberwolves concluded their 0-5 road trip on Friday, according to Wojnarowski (Twitter link). League sources told Wojnarowski that Thibodeau came to the realization Minnesota couldn’t win with Butler in such a dysfunctional environment, and told associates that the team wouldn’t play another game with Butler. Wojnarowski and ESPN’s Brian Windhorst also report (via Twitter) that team ownership was “heavily involved” on both sides of the negotiations, with Taylor and Josh Harris of the Sixers working closely with management to finalize a deal. Photo courtesy of USA Today Sports Images. Luke Adams contributed to this post. Sixers guard Jerryd Bayless suffered a sprained left knee during practice on Sunday and will re-evaluated in 3-4 weeks, according to a team press release that was tweeted by Yahoo Sports’ Chris Mannix. He will begin treatment immediately. The fact that Bayless will simply be re-evaluated in 3-4 weeks means he’ll likely be out of action for at least a month or so. He has a $8,575,916 salary in the final year of his contract. Bayless, 30, isn’t expected to play much when he returns. Philadelphia is well-stocked at the guard spots with Ben Simmons, Markelle Fultz, T.J. McConnell, J.J. Redick, Furkan Korkmaz, rookie Landry Shamet and two-way players Demetrius Jackson and Shake Milton on the roster. The 6’3” journeyman appeared in 39 regular-season games with the Sixers last season, including 11 starts. He averaged 7.9 PPG and 1.4 APG in 23.7 MPG. He’s also played for Portland, Toronto, New Orleans Memphis, Boston and Milwaukee since entering the league in 2008. The Cavaliers have reached out to free agents Luke Babbitt and Trevor Booker as they try to fill three open roster spots, according to Joe Vardon of Cleveland.com. Cleveland saw its salary commitments for 2018/19 take a huge dive when LeBron James signed with the Lakers, but the Cavs still have a payroll of about $109.5MM. That’s over the $101.9MM salary cap, but about $20MM below the tax apron with the full mid-level exception ($8.6MM) and bi-annual exception ($3.3MM) still available. Babbitt, 29, split last season between the Hawks and Heat. A career 40% shooter from 3-point range, Babbitt’s production fell after a February trade to Miami and he was barely used in the playoffs. Several European teams have expressed interest in signing him if he doesn’t land another NBA contract. Booker, 30, spent parts of last season with the Nets, Sixers and Pacers. A rugged power forward, Booker had his best season in 2016/17, when he averaged 10.8 PPG and 8.0 RPG for Brooklyn. No deal is considered imminent with either player, Vardon adds. One of the Cavaliers’ open roster spots may be reserved for Rodney Hood, who had trouble adjusting to his new role after coming to Cleveland at the trade deadline but is still a valued prospect. He remains part of the plan for the future, a team source told Vardon. Hood is a restricted free agent, and the Cavs can match any offer he receives. The source adds that Cleveland is “exploring all options” with its resources, including a $5.8MM trade exception from last summer’s Kyrie Irving deal that will expire August 22. In addition, Vardon relays that there’s nothing new on a rumored trade that would send Kyle Korver to Philadelphia in exchange for Jerryd Bayless. The Cavs may see if they can get more for the 37-year-old marksman before dealing with the Sixers. JULY 20: While a trade involving Bayless and Korver is possible, it’s “far from certain,” a league source tells Marc Stein of The New York Times (Twitter link). JULY 19: The Sixers and Cavaliers have had discussions about a Jerryd Bayless–Kyle Korver swap, sources tell Keith Pompey of the Philadelphia Inquirer (Twitter link). Philadelphia is involved in the Carmelo Anthony–Dennis Schroder–three-way salary dump along with the Thunder and Hawks, though the move is on hold at the moment with the Sixers reportedly looking to make another move before finalizing the transaction. The organization has very little cap room left and the acquisition of Mike Muscala, the big man who would join Philly in the proposed three-team deal, would put them over the salary cap. Korver will take home a salary of $7.56MM this upcoming season and he has $7.5MM on his contract for the 2019/20 campaign, though his salary then is non-guaranteed. Bayless will make approximately $8.56MM this season during the final year of his contract. Korver began his NBA career with the Sixers, playing 337 games with the franchise across parts of five seasons. With LeBron James no longer with Cleveland, the 37-year-old may welcome a deal to a more competitive team. The former second-round pick was a mainstay in the Cavs’ rotation during the regular season, although his participation during the playoffs was spotty, as the team had to sit him because of his inability to defend the perimeter. Bayless, who has dealt with various injuries since coming to the Sixers, hasn’t really carved out a nitch in Philadelphia. If the Sixers and Cavs make the swap, I’d speculate that an additional asset, such as a second-round pick or cash, will head Cleveland’s way as well. Korver sits fourth all-time with 2213 shots made from behind the arc. This past season, he took over five threes per game, making 43.6% of his attempts. The Cavaliers are not shopping Kevin Love, though he could be on the move if the right offer presents itself, ESPN’s Brian Windhorst mentions on the Lowe Post podcast. The scribe adds that Khris Middleton is in the same boat with the Bucks not deeming him untouchable nor looking to deal him. Cleveland waived Kendrick Perkins to “do right” by the big man and allow him to pursue training camp deals, a source tells Joe Vardon of Cleveland.com. The Cavaliers signed Perkins on the final day of the 2017/18 regular season back when LeBron James was still on the roster. The team had hoped to use Perkins’ contract as part of an offseason trade. The Pistons have added Tim Grgurich and Micah Nori as assistant coaches to Dwane Casey‘s staff, Ansar Khan of Mlive.com relays. Alex Boeder of NBA.com examines what Brook Lopez will bring to the Bucks. Lopez should be able to help the team stretch the floor with his three-point shot, as over 40% of his shots from the field last came from behind the arc. FIBA has banned Bucks center Thon Maker for three games in international play for his part in a brawl during a game in the Philippines earlier this month, according to an ESPN report. Maker said he disagreed with the decision in a written statement that was released on his Twitter account. New coach David Fizdale believes the Knicks will be in position to have a huge impact on free agency next summer, relays Marc Berman of The New York Post. Mario Hezonja represents the Knicks’ only major signing this year, but Fizdale gave a hint of what the organization expects 12 months from now. Enes Kanter‘s $18.6MM salary will come off the books in 2019, and the $38MM still owed to Joakim Noah may have been stretched by then. In addition, Ron Baker, Emmanuel Mudiay and Troy Williams are all potential free agents. Dante Exum‘s new contract with the Jazz may complicate the Celtics‘ negotiations with Marcus Smart, tweets Gary Washburn of The Boston Globe. Although he believes it’s “highly likely” that Smart returns to Boston, the news that Exum received $33MM over three seasons could make contract talks more difficult. They were drafted back-to-back in 2014, but Smart has played 99 more games and his career scoring average is more than four points higher. A buyout appears more likely than the stretch provision for the Sixers and Jerryd Bayless, according to Derek Bodner of The Athletic. Philadelphia has 15 players under contract and may need to open a roster spot for second-round pick Shake Milton or overseas prospect Jonah Bolden.